…would be just as useful. Following a recent orientation I gave for student employees within IU University Archives, it occurred to me that a microspatula can be just about as useful to archivists as it is to conservators. These small, hand-held pieces of metal with both rounded and tapered ends never fail in helping us with our jobs. 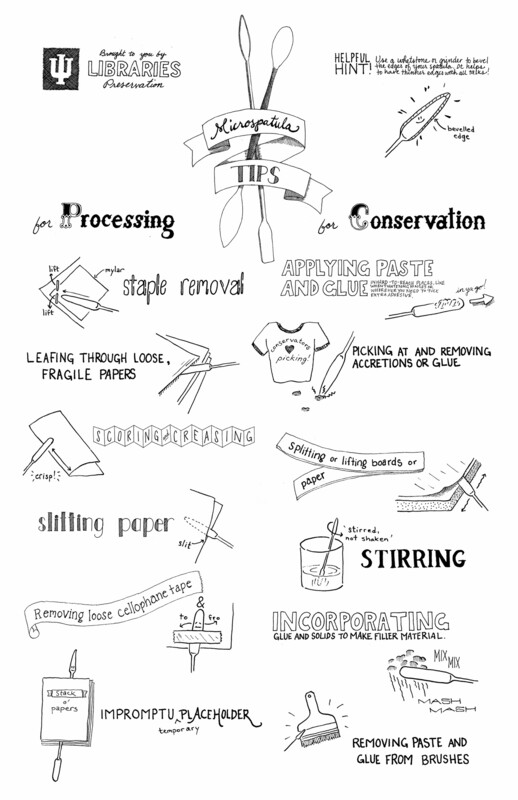 I decided that an informal poster might be just the thing to spread the word to students and share with fellow conservators, so Paper Conservation Technician Hannah Helton and I set to work making one. The list certainly isn’t exhaustive (other uses range from spreading poultices and setting down flaking paint, to cleaning fingernails and using as a hair stick!) but you may learn a new tip nevertheless. How do you use your microspat?